The conflict between the government and opposition in Syria will either have a peaceful resolution or the country will be destroyed, UN peace envoy to the country Lakhdar Brahimi said in an exclusive interview with RT's Sophie Shevardnadze. The violent dispute between the forces loyal to Syrian president Bashar Assad and the opposition has been raging in the country for nearly two years, with its death toll reaching 60,000, according to UN statistics. On Wednesday, a car bomb rocked the center of capital Damascus, leaving 53 people dead and 253 injured, with neither side claiming responsibility for the attack. All attempts to bring the government and opposition to the negotiation table have so far been in vain, but the United Nations has just prolonged the mandate of their peace envoy to Syria. Brahimi’s mission, which was due to expire on Friday, will now continue to at least the end of 2013. RT:Do you believe that direct talks between the leader of the National Coalition for Syrian Revolutionary and Opposition Forces, Moaz al-Khatib, and the country’s President Bashar Assad are possible? 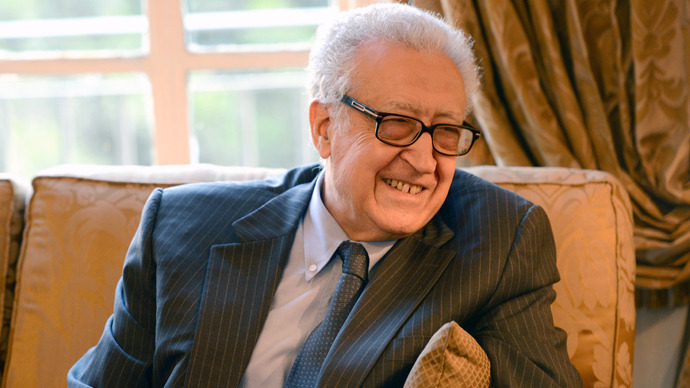 Lakhdar Brahimi: Not with President Bashar Assad, but with the government. It’s necessary. Yes, sure. I think there are more and more people who accept that there’s no military victory for any side and that you need a political solution. And that political solution needs negotiations. And negotiations, I think, can take place between the delegation representing the government and the delegation representing the opposition. RT:When you’re saying that you may be talking to the government, but not the president directly, is the problem only in one man – Bashar Assad himself - or his whole team? LB: The problem is that the opposition is saying every five minutes that they don’t want to talk to Bashar Assad. This is the problem. LB: No. He didn’t say that. He didn’t say that. RT:Has anything changed? Do you still believe that a peaceful resolution is Syria is possible? LB: First of all, Kofi never said that a peaceful resolution is never possible. He never said that. What he said was that he was counting on the international community to help him. And the international community did not help him. So he said – for the moment, we are in front of war. He never said that there will never be a peaceful resolution. So unless you are saying that there must be a military solution, which a lot of people say. But Kofi Annan didn’t say that and I’m not saying that. RT:What’s your take? Is peaceful resolution still a great possibility? LB: For the moment it’s extremely difficult. It’s not there. It’s not happening. But it is a must. Syria either has a peaceful resolution or then war for… I don’t know, until the country is destroyed. And if you don’t want the country to be destroyed – and I don’t think you do – then you really call for a peaceful resolution, difficult as it may be. The choice really is between destroying Syria or having a peaceful resolution. RT:Why do you think the Syrian uprising has such a strong terrorist element to it? LB: You see, this is again – what is it that you call terrorist? Very often a lot of people call terrorist what others call liberation movement. And I think in Syria we have something similar. There are definitely acts of horrible violence – unacceptable violence – that is done by both sides. But to say that the struggle is between the government and terrorist is a little bit pushing it too far.RT:Sure. The UN commission believes that jihadist terror brigades operating in Syria – Jabhat al-Nusra, Fatah al-Islam and Ahrar al-Sham – are backed from abroad. LB: A lot of people are backed from abroad that doesn’t necessary make them terrorists. The Jabhat al-Nusra is considered a terrorist organization by a lot of people, including a lot of Syrians. But it doesn’t mean that everybody is a terrorist in Syria. RT:What do you make of Saudi Arabia’s admission that they are actually supplying guns to the opposition? LB: A lot of people are supplying guns and they’re recognizing it. Yes, sure. The Russians are supplying guns to the government. They don’t deny that. We have a war now. Unfortunately, we have a war. A lot of Syrians – most Syrians, as a matter of fact – both from the government and the opposition are angry with me because I call it civil war. Let’s make it very clear that there are organizations that are objectively considered as terrorists. And there are organizations that are considered by the government as terrorists, as a matter of fact, who are not in Syria. The main struggle is really between a large part of the people of Syria, who want change. They want change in their country. And that is I think a legitimate aspiration. They want dignity. That’s what they said. They want dignity. They want change. They want democracy. This is the struggle. There are foreigners, they are a tiny minority, maybe a few hundreds, maybe a couple of thousands. But there are a hundred thousand at least of armed troopers, who are fighting against their government, unfortunately. So don’t try to say it’s foreigners, who are fighting against the Syrian government. This is not the case. RT:So you feel like Syrian people could go on living in a secular country even if President Assad goes? LB: That’s not what you ask. If you are asking then – yes, definitely. And I think that a lot of people in Syria and outside of it very much want Syria to continue to be a secular state. RT:Why do you think the conflict in Syria has taken so long? It’s been two years already. LB: That’s a good question. It’s the best question you have asked. You have a very strong well-organized regime who are determined to stay in power. They have the means. They have the military means to fight and they are doing so. The opposition is – in spite of all the weapons they receive – are not well organized. They are mostly civilians, who are taking up arms. And that’s why they can keep the struggle going, but they can’t win a military victory. But the government also can’t defeat them. You’ve seen this one thousand times. That’s why, once again, a political peaceful solution is what is necessary and good for the Syrian people. RT:When I was in Syria three months ago, Assad said that he’ll actually stay until 2014, wait for the election and see what happens. Is this a realistic plan? LB: I would very much like the problem to be solved long before 2014. If it were possible to do before 2014 it’s much better than waiting. RT:Because we’re taking about civil war and he’s talking about elections. How does those two go together? LB: They don’t. You can’t have election while civil war is going. You need to stop the civil war. And the civil war can be stopped through the negotiations on the basis of the Geneva agreement. So if we’ll have that resolution than we’ll have an election. What kind of an election depends on the results of negotiations. RT:Is Assad’s future is in his hands at this point? Should it be in his hands? LB: I don’t want to talk about that. RT:Do you think the only problem is in Assad and [the fact he’s] not stepping down? LB: A lot of people who are involved in this conflict in Syria think that the president is a serious important part of the problem. This is a fact and they repeat it every day. RT:Do you believe that’s the problem? LB: Doesn’t matter what I believe. It doesn’t matter what you believe either. RT:You talked directly to the American government – they believe that Assad is the problem. Do you think it’s an over-simplistic approach? LB: Yes, I’m sure you’ll interview the Americans and you will ask them. RT:Do you speak with the Syrian government and Assad directly as you speak to the opposition leaders? LB: You know, we have an office in Damascus and we keep in a very close connection and I saw President Assad in the end of December, sure. RT:What messages are they sending to each other? How has their behavior towards each other changed in recent months? LB: I don’t think it has changed enough to bring to the negotiating table. This is what a lot of people, including Mr. Lavrov, are working on. RT:The National Coalition for Syrian Revolutionary and Opposition Forces seems to be under influence from many international players. You have the Arab Gulf states. You have the US. You have Turkey… No? Tell me if I’m mistaken because that’s the impression we get. RT: All I’m asking is that is it hard to negotiate with a Coalition which is influenced by different international forces? LB: Everybody in the world today, people are connected to one another, they are influenced by one another. I deal with Russia, I deal with Turkey, I deal with the US because these are the countries that – I think righty, not wrongly – think that they have an interest, they have concerns, they have fears about what is happening in Syria. And I think they all can help the Syrian people and me get to a solution. RT:Do you fear that there’s a chance that an Iraqi scenario could unfold in Syria where sectarian violence spills over? LB: Absolutely, this is what needs to be avoided. This is what you have already some overtones of sectarianism that are becoming more and more visible in the struggle in Syria. And that’s why the earlier the problem is solved the better. RT:Who is to take care of that at this point? LB: I think both parties. Both parties have to be extremely careful to avoid and I think they are aware of it. But they need to be a little bit more careful not to allow the situation to slip into a purely sectarian conflict.